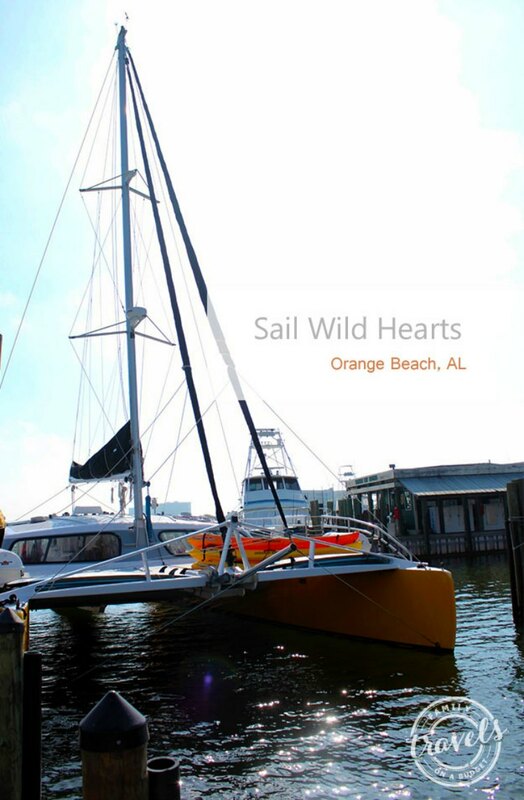 Wild Hearts is a 53-foot, open-ocean catamaran that sails the gulf coast of Alabama and Florida. The company offers a number of excursions, all managed by a capable crew. The catamaran itself has an upper sundeck that provides wide space to enjoy the sun and wind, the dolphins, the scenery and the ride! The cabin provides space for those who want some shade and plenty of space for the onboard serving area. The boat also has a men’s and women’s restroom (though they are a bit cramped). 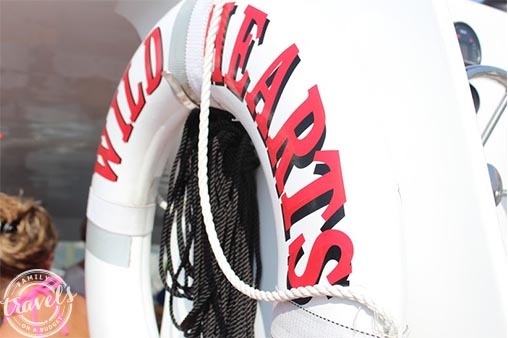 We chose to sail Wild Hearts because we’ve never been on a catamaran. I must confess, I expected a booze cruise type of adventure and worried that my daughter might be exposed to behaviors she’s not used to. I was pleasantly surprised! We got nothing like that at all! Our six hour cruise began with breakfast of fruits, muffins, cheese tray and nonalcoholic beverages. As the boat sailed away from the dock, we watched the fog lift and met our fellow travelers (most were families on spring break). We sailed into the Florida Gulf, and the crew positioned Wild Hearts just outside the Blue Angels show. Talk about best seats in the house! The Blue Angels flew up from the trees, over the water and directly over our heads! Absolutely incredible! One little guy (age 9) thought the planes were too loud, but the rest of us thrilled at the sight and sound of the show! During the show, the crew set out a lunch of meat and cheese platters, fruits, veggies, hummus, breads, cookies and other munchies. The cooler never emptied — soda and water were plentiful! We filled up on lunch as they took the boat to a quiet cove for more fun. 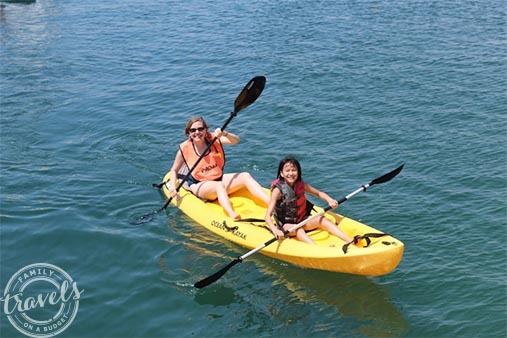 The all-day trip includes paddle-boarding, kayaking and relaxing on a quiet beach. 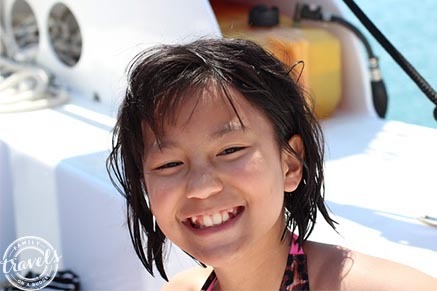 Kids — and some kids at heart — jumped off the back of the boat into the gulf water. After everyone had a chance to paddle and kayak, we got back onboard to discover a fresh supply of snacks and settled in for the ride home. The dolphins didn’t make an appearance until toward the end of our adventure, but they did not disappoint. They swam alongside as we sailed back to the dock. They were so fun to watch, I forgot to take photos! Believe it or not, there were three Karens on our sailing! Karen #2, a mom, said the boat was cleaner than she expected and the Blue Angels Show was definitely a must see. Karen #3 (that’s me) says the food was better than any day excursion I’ve ever been on — whether by boat or tour bus! The crew was top notch and the experience was not rushed. Great value for the dollar (though ours was provided by Wild Hearts and the CVB). Drew (age 15) said the highlights were the Blue Angels show and all the food and pop. 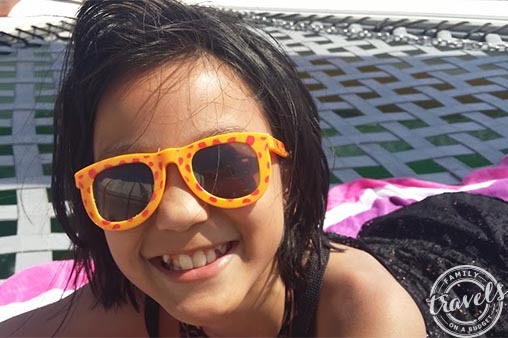 Alicia (age 9) said that her favorite part was seeing the dolphins and that it was fun to bounce on the waves and get splashed. 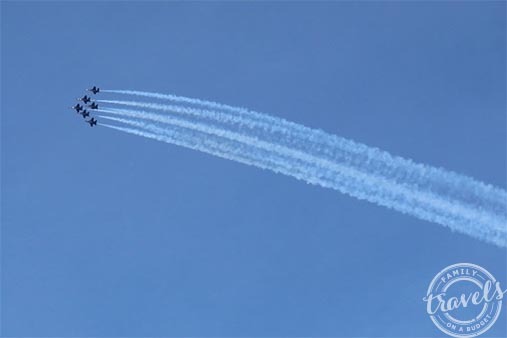 Braden (age 9) said that the Blue Angels were too loud. He doesn’t think this is a good choice for kids who don’t like loud noise. Sail Wild Hearts offers a number of sailing options. The Blue Angels all-day cruise is only offered select Tuesdays and Wednesdays throughout the spring and summer. See their website for a complete list of dates, times and costs. 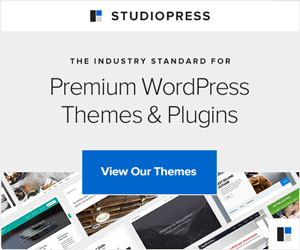 Special offers are available from time to time. Wild Hearts always offers a 10% military discount. All sailings include complimentary water. On the 2-hour dolphin cruise, other beverages are available for sale. Most longer cruises include food and non-alcoholic beverages. All guests can bring a small cooler of food/beverages on their sailing and adults 21+ can bring alcoholic beverages for personal use. If concerned about the weather, call ahead. The weather at one end of the beach can be quite different from the weather 15 minutes away. The captain has final say on cancellations for weather, turbulent water or mechanical issues. Rates begin at $25/adults for the 2-hour morning dolphin cruise. Advanced reservations are required for most cruises: Call 251-981-6700. Bring sunscreen! And then, don’t forget to reapply (like we did). The cool breezes can fool you into thinking you’re not burning. OUCH! Arrive 30 minutes before your scheduled sailing. ALL guests must check in and sign a waiver (adults sign for kids) before boarding. There are plenty of chairs and shade in the check-in area. 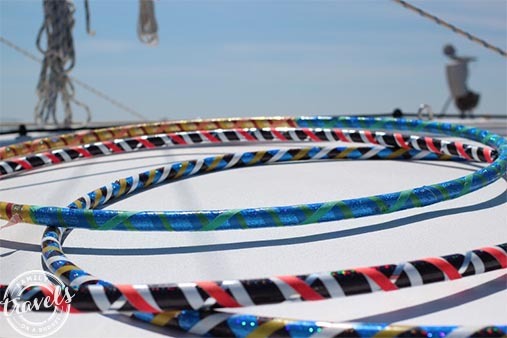 Sail Wild Hearts launches from the Perdido Beach Resort pier which is located on the bay side near the Perdido Beach Resort tennis courts. Just follow the signs! No one in our family suffers from motion sickness, so we had no trouble, but a catamaran in general is more steady than other boats. Consider the severity of your motion sickness before sailing. No one on our cruise had any issues. The restrooms are small and located down a short ladder. Those who have serious mobility issues might not be comfortable on this cruise.